We had an amazing afternoon learning how to knit! The members of Boston Handmade have many varied talents and we regularly have Skill-Share Workshops to teach each other what we know and love to do. Our workshops cover many subjects in the world of arts, crafts, and also in the realm of the business of being professionals in the arts. 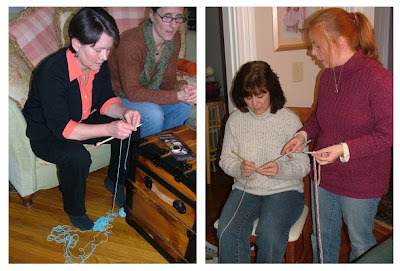 Last Saturday Lynne of Cozy Cottage Creations hosted a knitting workshop at her home where she and Louise of THE HOLE THING taught several of us novices how to make an object out of a piece of yarn - how amazing! The Boston Handmade members who took part in this day of fun and learning were Betsy of Stonehouse Studio, Chris of Christine Marie Art, Beth of Elizabeth Brennick Designs, Nicole of Designs by Lulubelle, Allison of Fraske Designs, and me, Jessica of Reclaimed To You. Lynne and Louise were wonderful teachers and VERY patient, and we all came away with a new skill to explore. 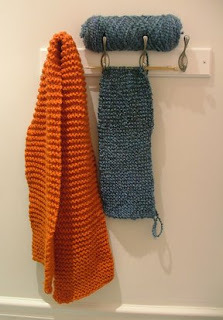 I finished my orange scarf and began a blue one. 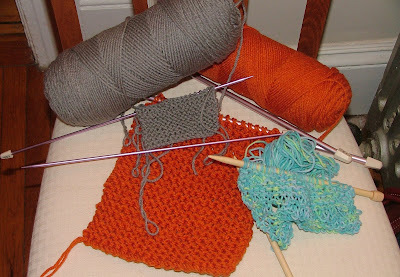 Also, I stumbled upon a weekly knitting group in my own neighborhood and they are encouraging me to try to make a hat. I plan to go to their gathering tomorrow and see if I can get started on that. I've been knitting on the T when I go downtown to meet with clients a few days a week, and also knitting a little bit at night before going to bed. I love knitting! Thank you to Lynne and Louise for being such good teachers! i had so much fun and am definitely going to the next one! im buying some more knitting needles and yarn tonight! go Jessica! You are a knitting fiend! I had a great time! Thanks ladies for teaching all of us. I posted my finished cowl on the Boston Handmade flickr group. I am so proud of my knitting friends ! I'll come help you all again anytime. We can move onto phase two !